Ultimately, my hope is to inform the ordinary person as well as psychologists, therapists and other mental health clinicians that there is a method to train the brain to be less inclined to produce discomforting thoughts, which are often the key catalyst to worry and rumination. LINKӦ Psychologist Olle Wadström has published his revolutionary approach to overcoming intrusive, anxious or obsessive thoughts that foster anxiety tied to ordinary activities like participating in a work meeting, cultivating a new romantic relationship or holding a conversation with an acquaintance. 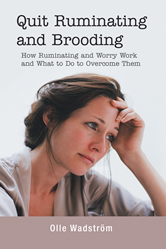 In “Quit Ruminating and Brooding: How Ruminating and Worry Work and What to Do to Overcome Them,” Wadström encourages readers to honestly evaluate the way that ruminations and anxiety affect them and teaches them how to train their brain to stop producing discomforting thoughts through the application of well-proven behavioral therapy methods with scientific support. Wadström’s book likens intrusive thinking to a tennis match between discomforting and comforting thoughts, in which the pleasant thoughts people tend to summon when faced with a worry or concern reinforce the angst they are experiencing and cause it to return and multiply. Ultimately, “Quit Ruminating and Brooding” addresses the tensions a person experiences when trying to understand the incomprehensible or resolve the unsolvable. To ruminate might provide some instant ease. But quite the opposite of what one thinks, those comforting thoughts fuel one’s brain to produce even more and worse discomforting thoughts. “Ultimately, my hope is to inform the ordinary person as well as psychologists, therapists and other mental health clinicians that there is a method to train the brain to be less inclined to produce discomforting thoughts, which are often the key catalyst to worry and rumination,” Wadström said. Peppered with simple, engaging illustrations, “Quit Ruminating and Brooding” presents a new method that is highly applicable to anyone who experiences worry, regret or remorse when it is not objectively relevant, whether in relation to health, career growth, parenting, relationships and the economy or more trivial matters, such as how one is perceived in social settings or old injustices that have festered. Olle Wadström is a lecturer, licensed psychologist and therapist who specializes in cognitive behavioral therapy. Wadström has more than 47 years of experience as a clinical psychologist, has treated about 1,500 patients with anxiety disorders and depression and is an expert in the fields of clinical and pedagogic psychology. He currently resides near Linköping, Sweden. To learn more, please visit http://www.quitruminating.com.